Your international seasonal staff are authorized to work legally under their J-1 Visa status. This visa allows each student to work only for the dates listed in Section 3 of their DS-2019 Forms. The maximum work authorization period for the Summer Work Travel program is four months. InterExchange is designated by the U.S. Department of State to issue the DS-2019 Form, which allows students to apply for a J-1 Visa. The DS-2019 Form permits students to work during their stay in the U.S. The form identifies InterExchange as the student’s program sponsor, describes the purpose of the program, and states the time period during which a student is allowed to work. In order to obtain J-1 Visas, students bring their DS-2019 Forms, job offers, and passports to the U.S. Consulate in their home country. The dates between which a student can legally work are listed in section 3 of the DS-2019 Form. Students have 30 days to travel after the last date in section 3 of their DS-2019 Form. Students are not legally allowed to work past the final date on the DS-2019 Form. InterExchange is the official J-1 Visa sponsor for each student. No one except InterExchange or a government agency can cancel a participant’s visa. Any employer who threatens a J-1 Visa Exchange Visitor with deportation or visa revocation will not be allowed to continue participating in the program. A J-1 Visa is a sticker in the student’s passport issued by a Consular Officer at a U.S. Consulate abroad. The purpose of the J-1 Visa is to indicate a window of dates during which the student may enter the U.S. Think of the J-1 Visa only as the student’s authorization to enter the U.S.
InterExchange is the sponsor of the J-1 Visa for each student. Only InterExchange or a government agency has the right to cancel a student’s visa. Host employers are not able to change a participant’s visa status. 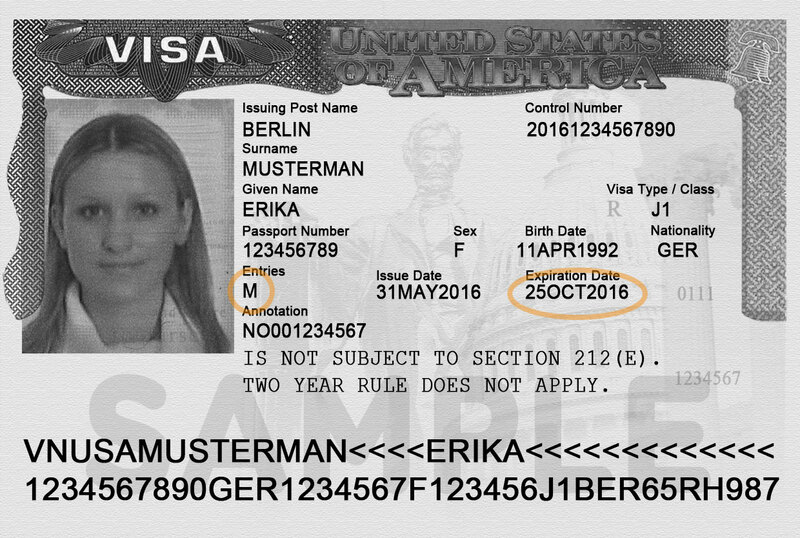 The expiration date on the J-1 Visa is the last date a student is allowed to enter the U.S. For example, under the heading “Issue Date” it may say June 3, 2015 and under "Expiry Date" it may say October 3, 2015. This means that the student is allowed to enter the U.S. anytime between these two dates. For some nationalities, the expiration date on the J-1 Visa may come before this program’s duration (four months). This does not mean that he or she must leave the country before the Work & Travel USA program ends, only that they must enter the U.S. before the expiration date on the J-1 Visa. M = Multiple entries up to expiration date. If “1” is indicated, the participant may enter the U.S. only once. Important: If the student plans to leave the U.S. to travel and then come back to the U.S., he or she must have a multiple entry visa and reenter the U.S. before the expiration date on the J-1 Visa. For some nationalities, the dates on the J-1 Visa may extend past the duration of this program (past four months). This does not mean that he or she is eligible to stay in the U.S. past the four-month period of the InterExchange program. If a student wants to participate on another InterExchange program in the future, he or she does not need to apply for another J-1 Visa as long as the current one has not expired. However, the student will still need to return home and reapply to InterExchange to obtain a current and valid DS-2019 Form, as the J-1 Visa is not valid without one! The number of times a student may enter the U.S. on the J-1 Visa is indicated under the heading "Entries." You will find either a number or the letter “M” under this heading. 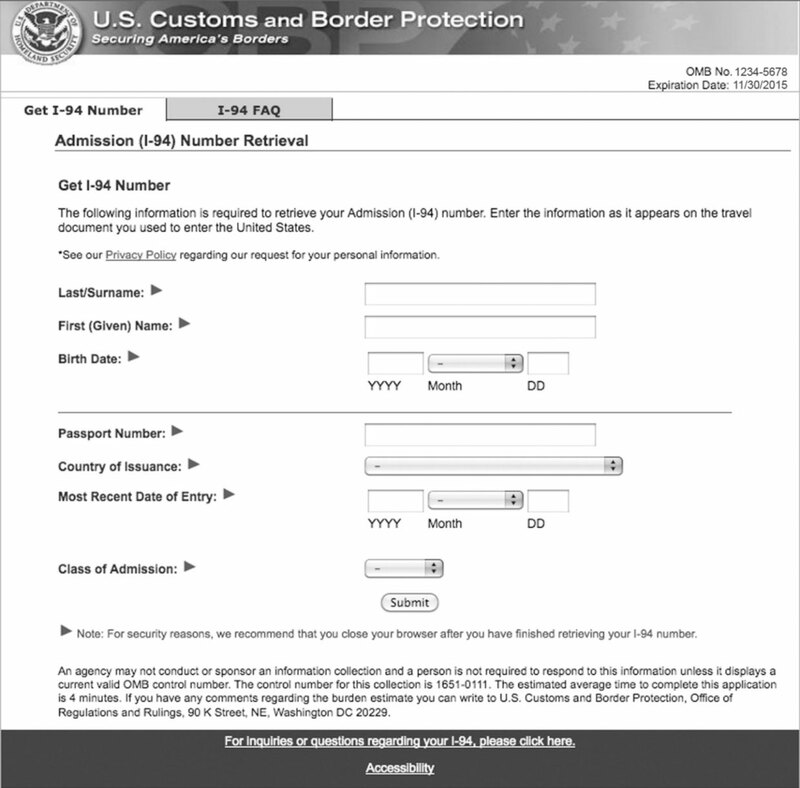 If you find a number, this means the student is only allowed to enter the U.S. that many times between the Issue Date and the Expiry Date on the visa. Because he or she is already in the U.S., one allotted entry has been used. If the student has an “M” under Entries this indicates a multiple entry. This means the student can leave and reenter the U.S. as many times as he or she wants, but the last re-entry must be before the visa Expiry Date or before the end date of their DS-2019 Form, whichever is earlier. The dates on the J-1 Visa do not tell you how long the student is eligible to work. The dates of work eligibility are found on the DS-2019 Form. The Expiry Date on the J-1 Visa does not mean that the student must go home by that date. Work & Travel students are allowed to stay in the U.S. for four months of work as indicated on the DS-2019 and a 30-day grace period for travel. The Expiry Date on the J-1 Visa does not mean that the student is allowed to stay in the U.S. until that date, only that they can enter the U.S. until that date, with a valid DS-2019 Form. 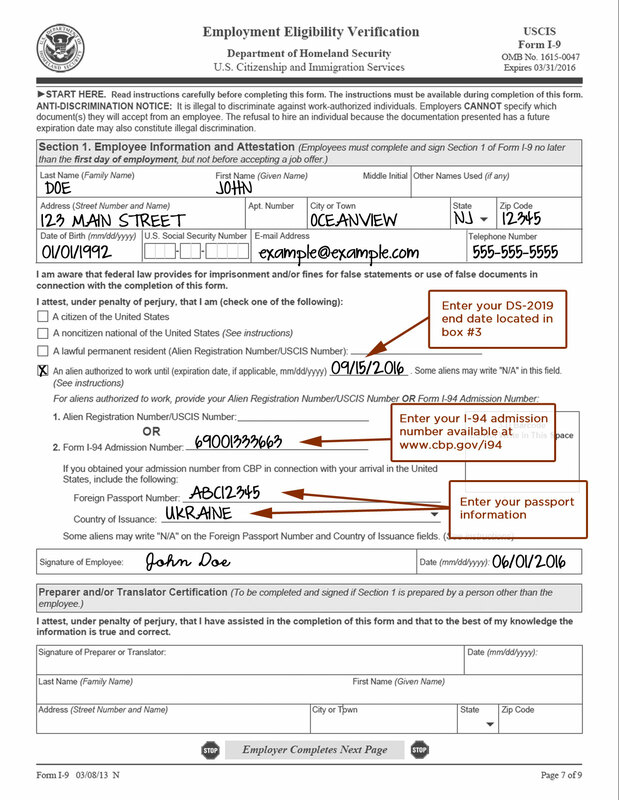 The J-1 Visa and the DS-2019 Form are the documents needed to enter the U.S. as an InterExchange-sponsored exchange visitor. The Work and Travel J-1 Visa is non-extendable. If one of your students wishes to travel outside the U.S. and reenter after the expiration of the J-1 Visa, he or she must apply in advance for a tourist visa. The U.S. Citizenship and Immigration Services (www.uscis.gov) recommends that the person do so 45 days before the expiration of the J-1 Visa. We strongly recommend that students make copies of any applications and other materials that they send to USCIS. InterExchange is unable to assist students in obtaining other visas. This arrival record is issued by the U.S. Bureau of Immigration and Citizenship Services upon the student’s arrival in the U.S. The student is required to go to the following website to retrieve the I-94 document. It indicates the day the student arrived, their admission number, passport number, and class of admission. The admission number is located on the top row of the electronic I-94 arrival record. Below the admission number is the admit until date, which generally has “D/S”, or Duration of Status, written next to it. This means that the student is legally allowed to remain in the country for the length of our program, which is four months plus 30 days to travel. The student is permitted to work between the dates indicated on the DS-2019 Form and is allowed an extra 30 days to travel. All students should fill out an I-9 Employment Eligibility Verification Form after arriving at their job sites. We have provided a sample of a typical I-9 for an InterExchange Work & Travel USA student. All students are legal aliens authorized to work. Admission numbers are located on their I-94 cards. Use a passport and electronic I-94 arrival record as a List A document. 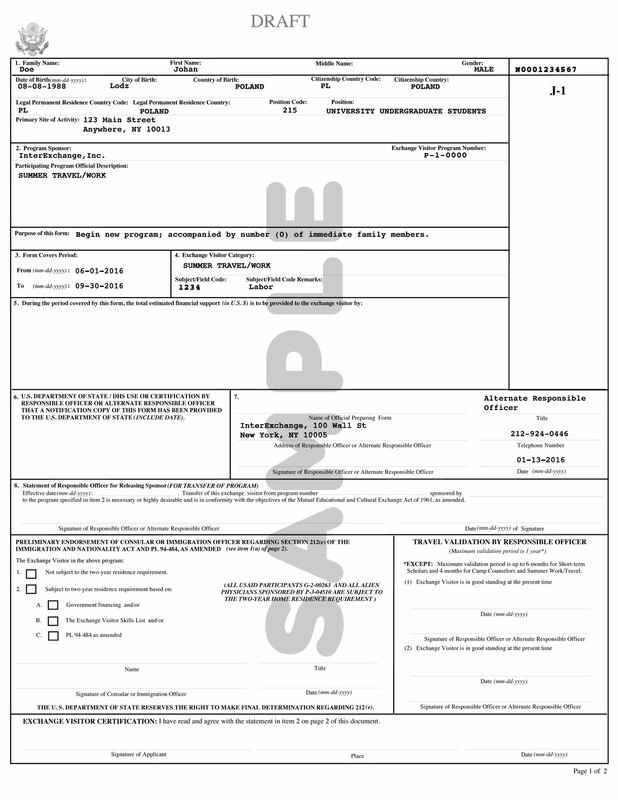 For List C documents, you should use the DS-2019 number and the program end date (DS-2019 form expiration date located in Box 3). For complete information about filling out the I-9, please refer to the Handbook for Employers — Instructions for Completing Form I-9, published by the USCIS. You can download a PDF of the handbook from their website. These documents collectively serve as legal verification of the student’s identity and his/her eligibility to work legally while in the U.S. Keep all records on file for at least three years for your own reference or as required by law. If students will be working at any other locations or businesses owned or operated by your company. If there are changes to students’ job titles. If students are not meeting the requirements of their position. If a student leaves his or her position ahead of the planned departure date. If students do not arrive to work. In the event of an emergency involving a student or any situation that impacts their health, safety or welfare. My InterExchange student’s visa is good for a year; can he or she stay and work for me until his visa expires? No. The dates that students can work are in section #3 of their DS-2019 Forms. All students must return home within 30 days of the end of their work period. I hired a student to work until October 15th and his DS-2019 Form says he can work that long, but his J-1 Visa expires on October 1st. What should I do? The student is allowed to work for the four month period covered on his DS-2019 Form. If his or her visa expires October 1st, it does not affect his or her ability to work legally. He or she can work until October 15th, per the DS-2019 Form. The visa expiration date indicates the last day he can enter the U.S., not the last day he can work. He or she should not, for example, travel to Canada after October 1st, as he or she would not be allowed re-entry into the U.S., unless he or she applied in advance for a tourist visa.